JUBA, South Sudan (CNS) — When South Sudan’s fledgling democracy suddenly unraveled in December, what started as political infighting within the country’s ruling party quickly ripped along ethnic fault lines, often pitting neighbors against each other according to the tribal markings on their faces. Within a few days, thousands of people were dead — the exact count is unknown — and tens of thousands more were seeking shelter from the violence. In Juba, the disheveled capital city, many of those from the Nuer tribe, feeling at a disadvantage to the dominant Dinka, sought safety on two sprawling bases of the United Nations peacekeeping mission. Almost four months later they remain. Shipping containers are double-stacked around the perimeter, blocking stray gunfire. Blue-helmeted Mongolian troops tightly control the handful of entrances. 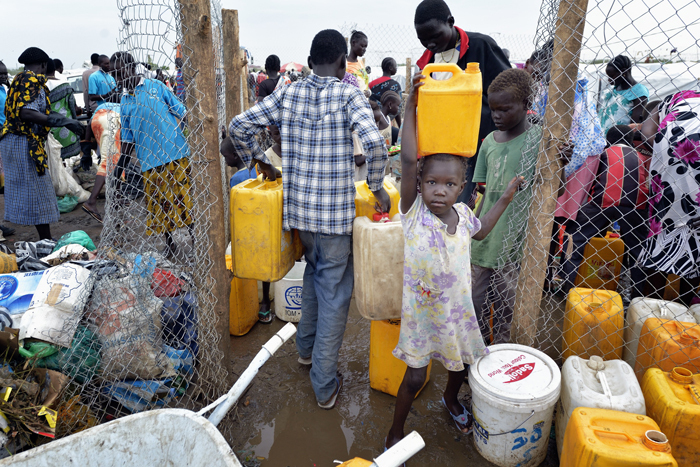 In the larger of the two U.N. bases more than 21,000 Nuer remain packed under endless streams of plastic sheeting stretched between poles. It is crowded and it smells bad. Yet few talk about wanting to go to the second site the U.N. has offered across town. “There’s no security in Juba, so people are targeted for violence. The Nuer are targeted,” said John Nur, a young man who said that before the crisis he worked for the International Republican Institute, a U.S.-based nongovernmental organization promoting democracy worldwide. Some camp residents venture out during the day to a nearby market. A few go to jobs before returning to the camp by nightfall. One Nuer member of the South Sudan parliament commutes to legislative sessions from his tent in the camp. From the first moments of the violence, camp residents have been accompanied by a group of Catholic sisters from India. “We’ve been working in the bush with war-affected people, but when we heard the cry of the people here, we came on the first day to provide trauma counseling and to work with the women and children,” said Sister Amala Francies, project coordinator in South Sudan for the Daughters of Mary Immaculate. The sisters return daily, bringing food, counseling women and organizing activities for children. There are no formal schools in the camp, so were it not for the opportunity to gather with the sisters in a few large tents donated by UNICEF, the kids would have nothing to do. “We want to give the children an opportunity to leave their trauma behind for a few minutes, to give them some freedom. We teach them English and some of their letters,” Sister Amala told Catholic News Service April 1. The nuns also work for reconciliation. The congregation has about 20 sisters in South Sudan. 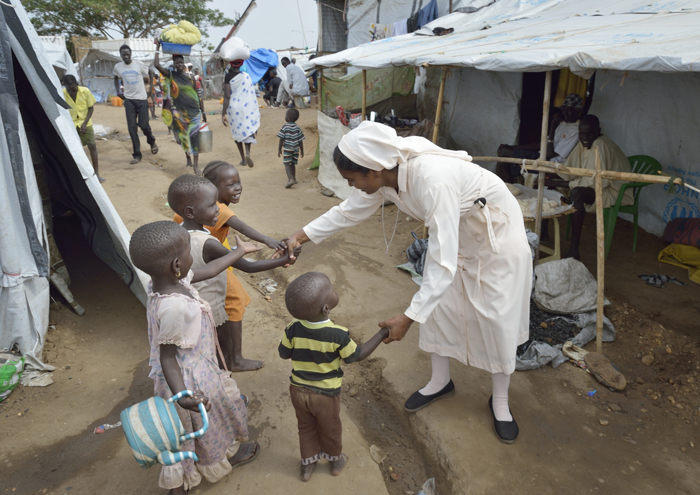 Half of them serve a remote area near Wau, while the others are in Juba and have made the camp their parish, despite sporadic outbreaks of violence. The U.N.’s operation of the camps has drawn criticism. Some Dinka leaders have accused the international organization of harboring assassins in the camps. Doctors Without Borders accused senior U.N. officials April 9 of a “shocking display of indifference” toward the wellbeing of camp residents as the rainy season gets underway and the camp inexorably turns into a muddy quagmire. Apart from the inevitable political controversy the camp generates, the sisters’ quiet ministry of accompaniment remains critical, one U.N. official admitted. The sisters also provide the framework for a larger Catholic presence in the camp. Several priests and other religious regularly visit the sick in the small camp hospital. Sunday Mass is celebrated by priests from Juba. Among recent celebrants was Maryknoll Father Jim Noonan from the United States. He said the singing and dancing during Mass left him convinced that camp residents retain “a deep sense of God’s presence” amid the many challenges they face.